Guanciale is cured pork jowl. It is the traditional ingredient for Spaghetti alla Carbonara, Amatriciana and Gricia, but difficult to find outside of Italy. 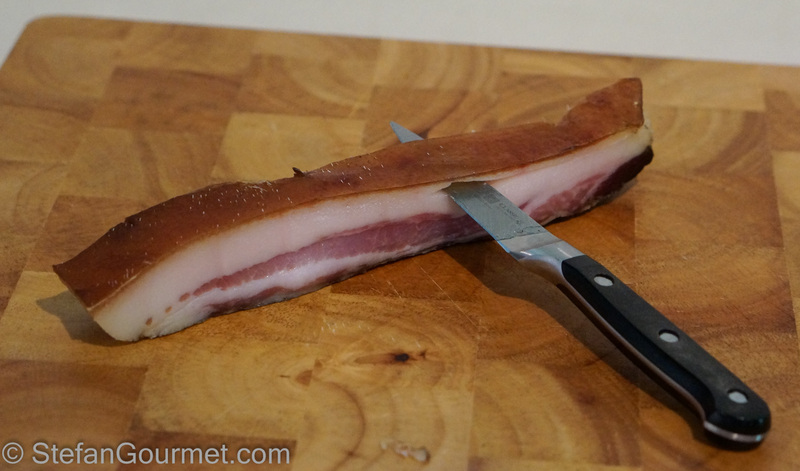 Pancetta (cured pork belly instead of jowl) can be used as a substitute, but of course it is nicer to use the real thing. 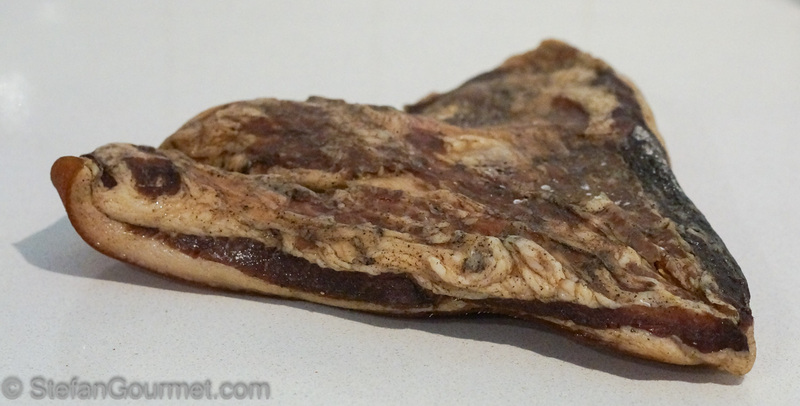 After the success with making my own homemade pancetta, I also wanted to try making my own guanciale. 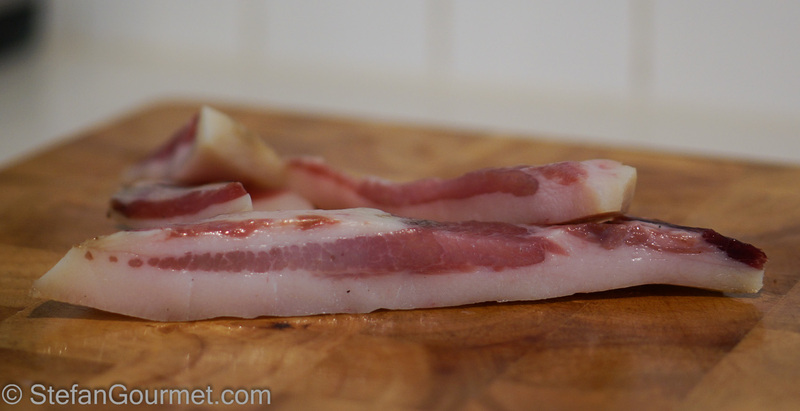 Pork jowl is not as easy to find as pork belly, but luckily my butcher was willing to sell me some. 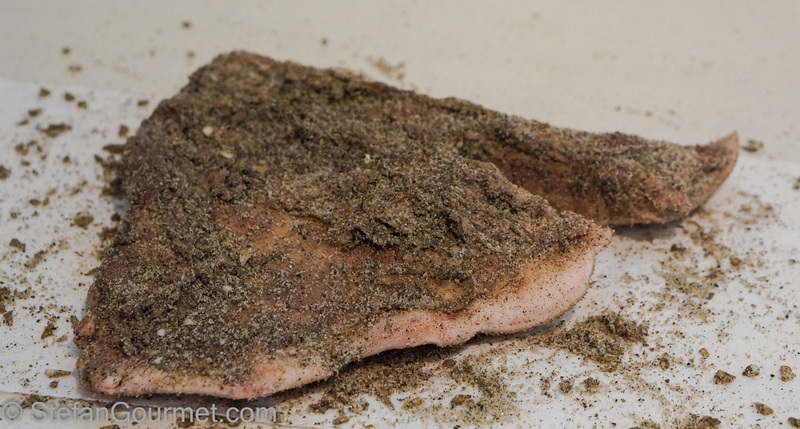 I used a basic spice mix (only salt, sugar, black pepper, and garlic) to be able to taste the difference with pancetta. The process of making it is quite easy and takes about 5 weeks. You only need a place with suitable conditions: cool (16ºC/60ºF) and a free flow of air. A cellar would be perfect and very traditional, but our garage was just fine. 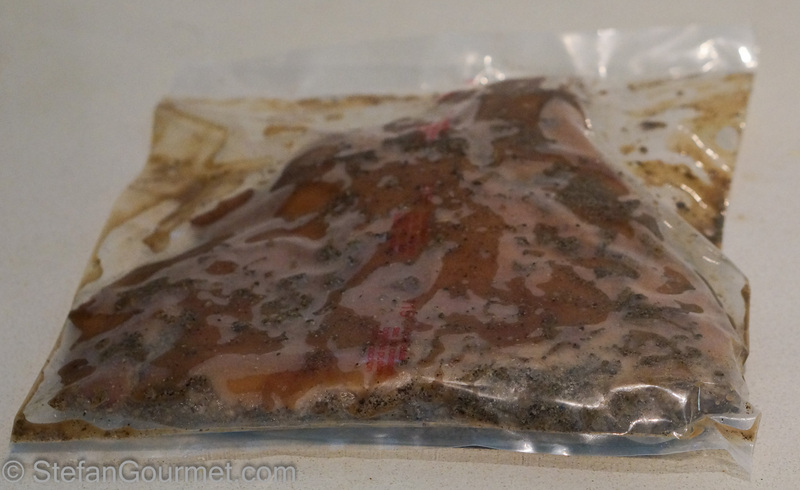 It is now getting warmer, so more guanciale and pancetta making will have to wait for the fall. 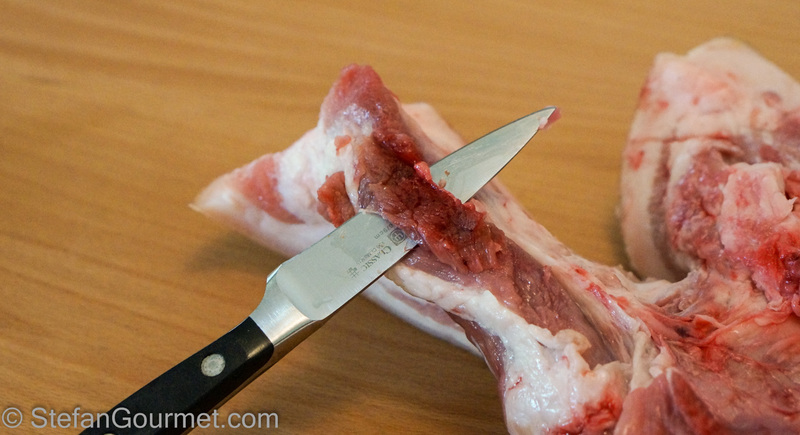 Start by trimming away all the bloody meat, glands, and other stuff that looks nasty. Keep trimming until it looks clean. 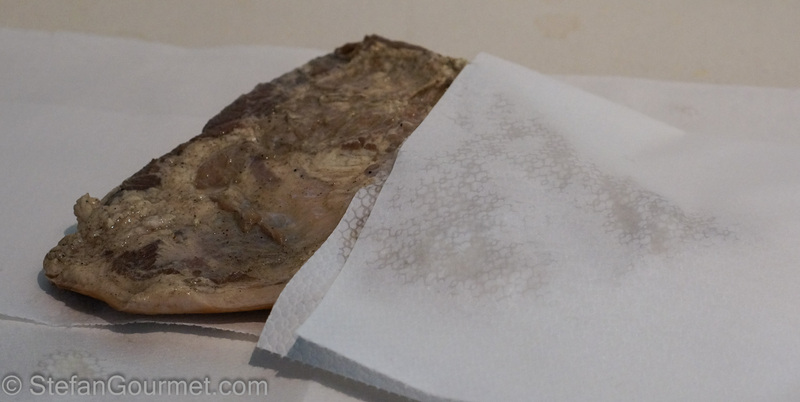 Then rinse the pork jowl under cold running water and pat dry with paper towels. 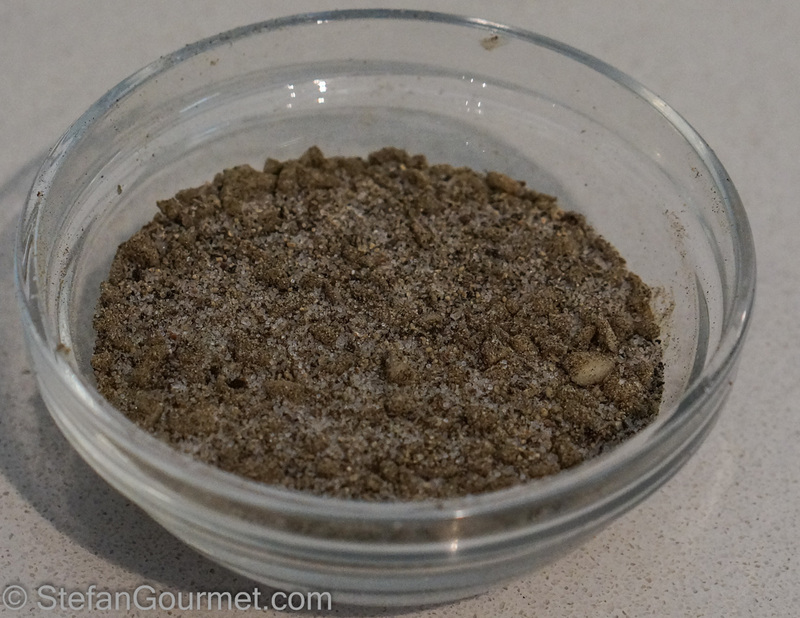 Combine the salt, pepper, sugar, and garlic in a small bowl and stir to mix. Rub all of the curing mix on the meat, making sure to rub it into all he nooks and crannies. 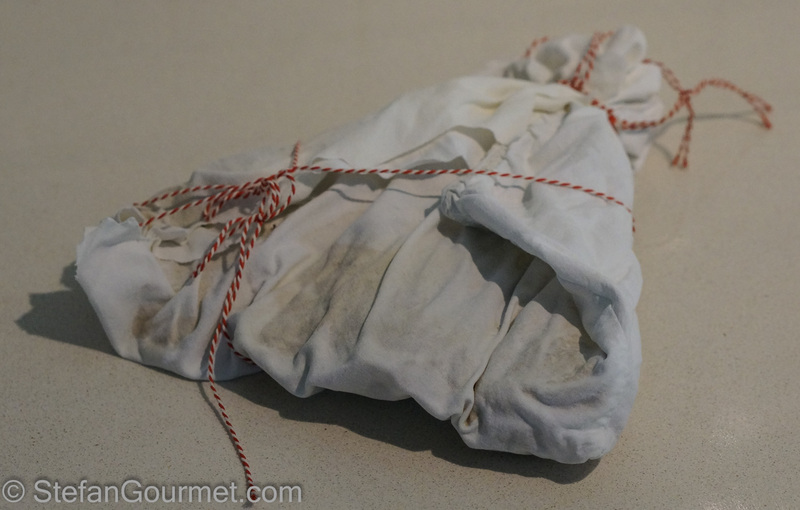 Seal the meat in a plastic bag (not vacuum sealed) and refrigerate for a week. Turn once per day. After a week the meat will have released a lot of juice. 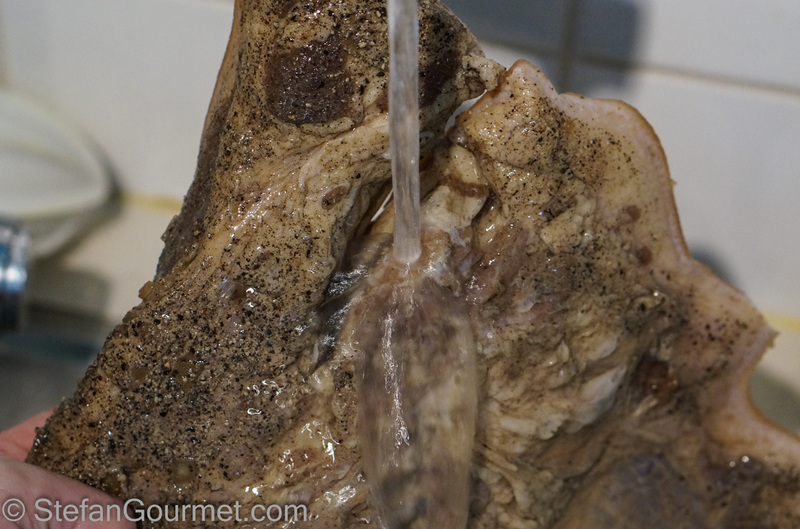 Take the pork jowl out of the bag and wash it under cold running water, removing all of the curing mix. 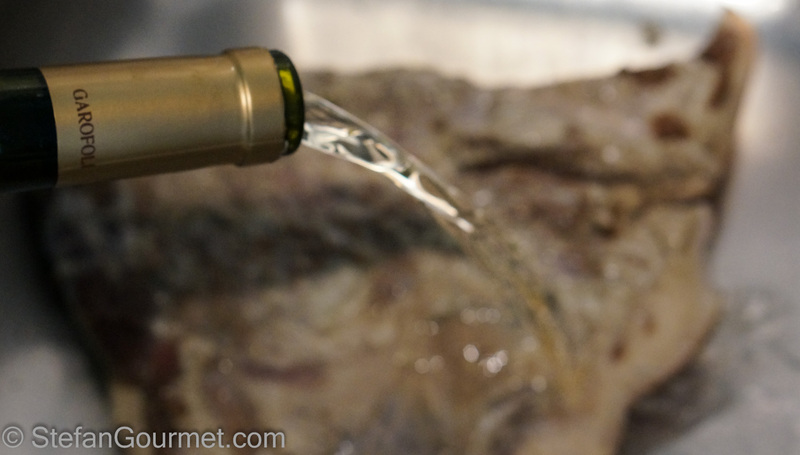 Wash the pork jowl with a neutral white wine. 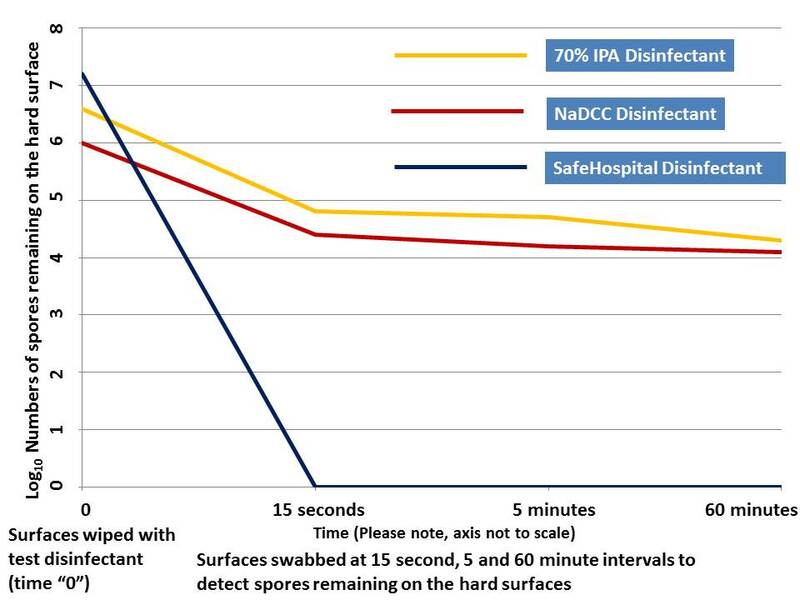 This helps to kill germs on the surface. 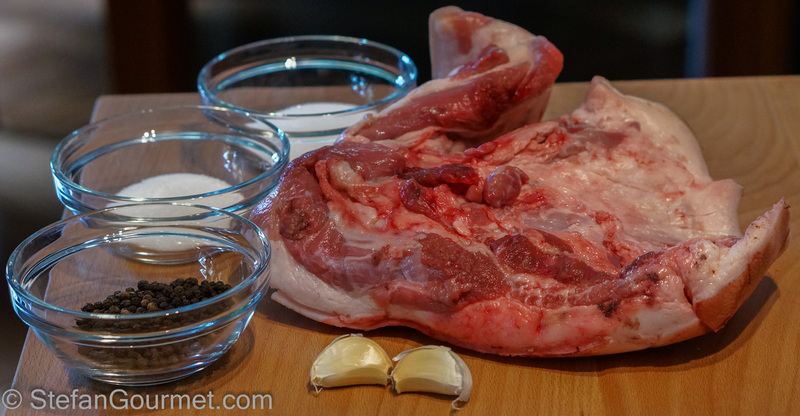 Make a hole in the pork jowl with a sharp knife to hang it. Put a piece of kitchen twine through the hole. 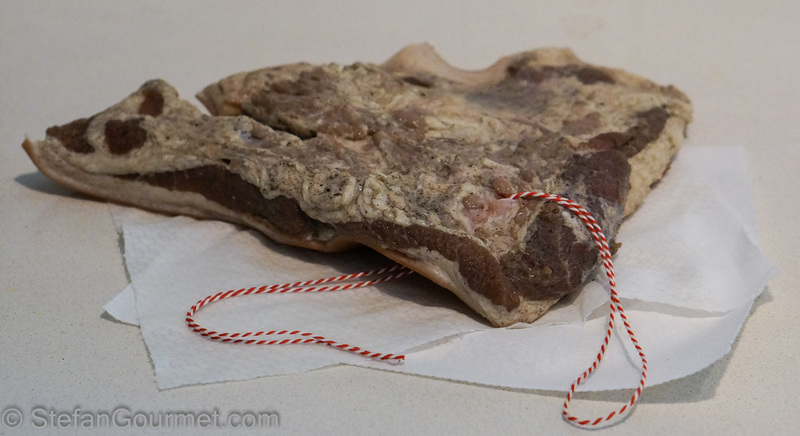 Hang the pork jowl in an area suitable for curing, and loosely wrap it with a clean piece of cloth to protect it from flies etc. Allow to cure for 4 weeks. After 4 weeks, take it down. Remove the bag. In my cases there was only 0.7 kg left of the original 1.2 kg (58%). 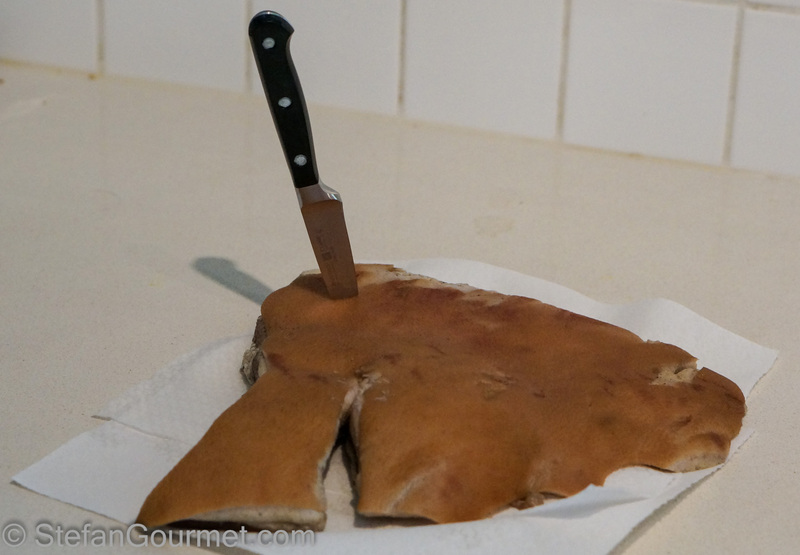 Trim the rind with a sharp knife. 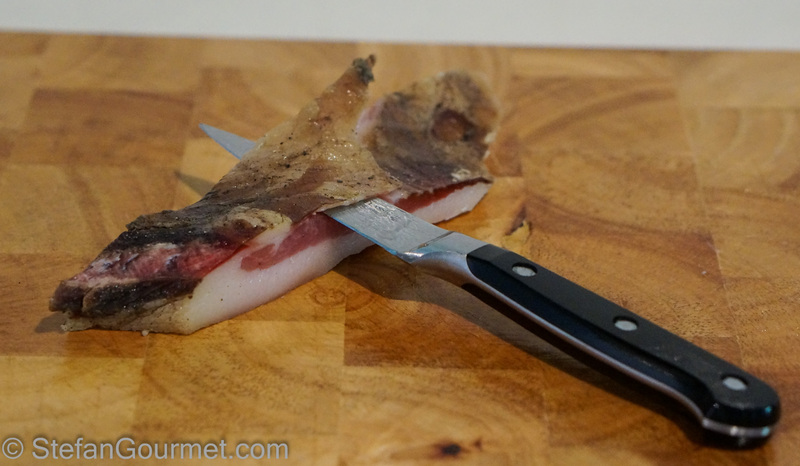 I find this easier to do when the guanciale has been cut into thick strips. Also trim the dry outer layer. After trimming there will be about 450 grams (1 lb) left (38%). 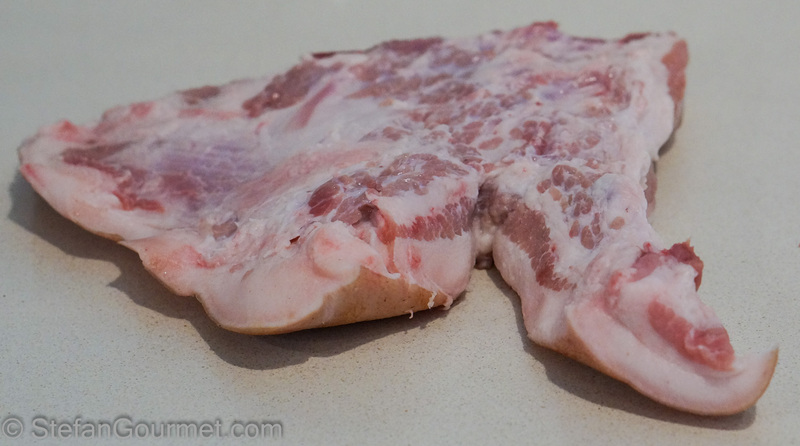 I paid a bit over 4 euros (almost 6 US dollars) for the piece of pork jowl, so homemade guanciale is not expensive at all ($6/lb, or 9 euros/kg). 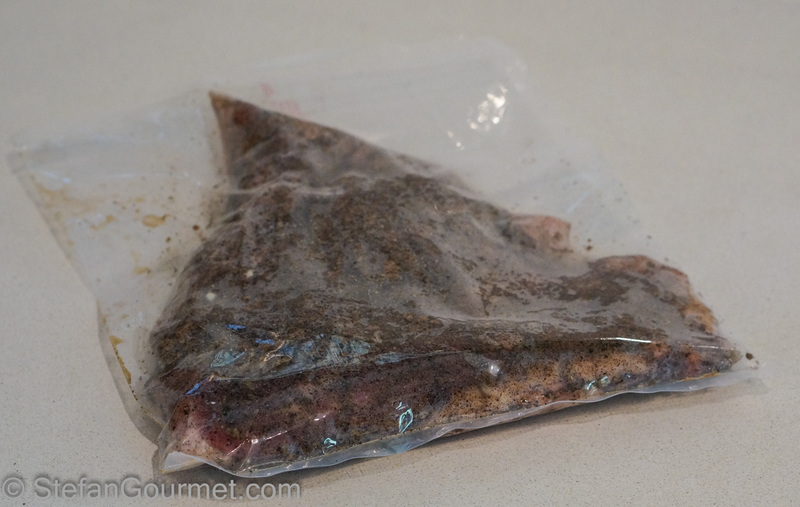 That’s all there is to making your own guanciale! To store, vacuum seal and freeze until needed. 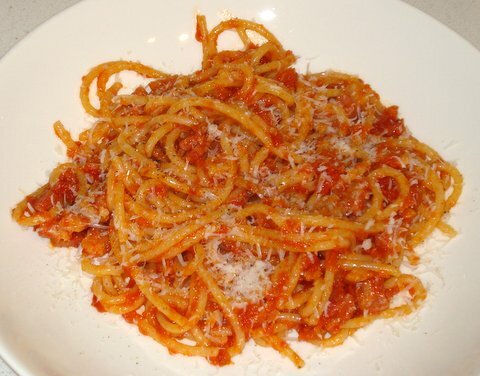 A very appropriate flashback today: Spaghetti all’Amatriciana, or spaghetti with a sauce of tomatoes, guanciale (or pancetta), dried hot chile pepper, and garlic. This is my second lot of guanciale that I have made it’s really good and fresher than going to the delicatessen when I need it I have it at home and I have sealed and freezes it and it’s as good as fresh. Wow! I wish I could taste this!!! This post is absolutely fascinating. I love the photo of the pork, just hanging out, from the ceiling. Like Mimi, I am super impressed! Will definitely try the Guanciale. Did it taste different from the Pancetta? Lovely Stefan. You got me with the sentence “The process of making it is quite easy and takes about 5 weeks.” The photos are excellent too. What a great idea! 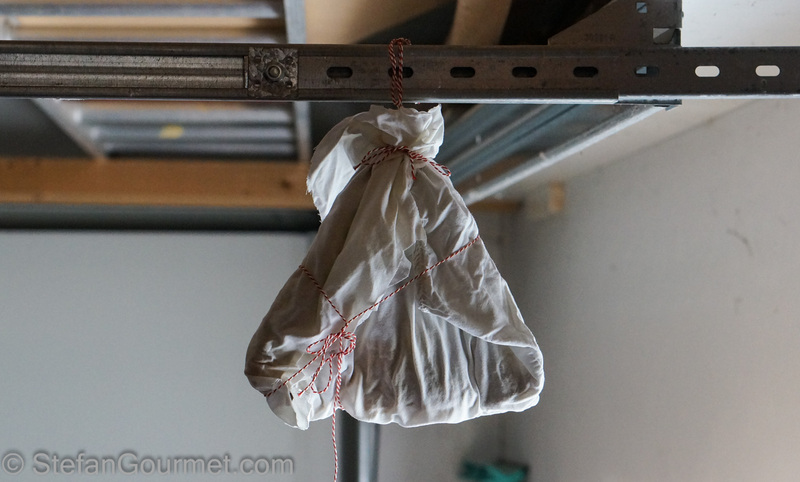 It is coming into winter here so a very good time to have some meat hanging up. This IS interesting! Have never tried but with our winter just having begun and our daytime temps about 14-16 C, there is no reason not to make use of my garage also 🙂 ! The method is so easy, all one can possibly lose is a piece of not very expensive meat and let loose a few words not used in public 🙂 !! Have just begun to grow my own mushrooms in the same spot, as every winter 😀 !!!! This looks amazing-not sure i have the patience to wait that long though. it looks delicious. This looks great!!! Sadly, cool temperatures are few and far between in DFW, especially now. So, I am relegated to finding it at specialty shops in the area. 😦 I am sure there is no comparison to making your own. Oh I have to try this! !